Sorrento is a surprisingly versatile destination. It makes a good out-of-season base for walkers and culture-lovers, a relaxing resort for some luxurious dolce far niente ('sweet doing-nothing'), and an easy-to-reach summer holiday spot. There are a variety of types of holiday you can enjoy in Sorrento, and where you stay will play a big part in determining that. 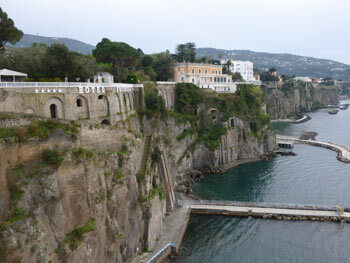 The Sorrento area spreads over a plateau between the hills and the sea. The historic town Sorrento is nowadays at the heart of a larger urban area; it's situated at the western end of the plateau, and the coast road heads uphill to the west just after the town centre. Further east are the towns of Sant'Agnello, Piano di Sorrento and Meta di Sorrento. Although the four towns have separate names and separate identities, in reality they are all joined together as a kind of suburban sprawl dotted with hotels. When you look at booking pages, you can click on the map to see the hotel's exact location; this is a very helpful tool to make sure you don't end up unexpectedly miles from the centre. On this page I describe the different locations and types of accommodation in and around Sorrento; you can choose from five-star luxury - and some of the best hotels in Italy - or a budget hostel, and everything in between. The best area to stay in will depend on your budget and what kind of holiday you're planning. It's important to note that there are very few beaches in this area; sea access is mostly from the wooden platforms of paid-entry lidos. So if you're visiting with children, consider choosing a hotel with a family-friendly swimming pool. Also bear in mind that in Italy hotels rarely have bars or restaurants. In this area, which caters for many English-speaking guests, you'll find plenty that do. But the food in a hotel - prepared, perhaps, for package-holiday Brits - is unlikely to be as good as the food you'll find in local restaurants. A half-board option will take away the pleasure of sampling local eateries of your choice, though of course it can be a convenient option if you're staying out of the centre or with children. Looking through the listings you'll find a large number of B&Bs and apartments as well as traditional hotels. It's important to check these have a good number of guest reviews, and read the small print before booking (are there extra charges, e.g. cleaning? is there a left-luggage service if you'll be leaving late on your final day? do you need to let the staff know your arrival time in advance?). 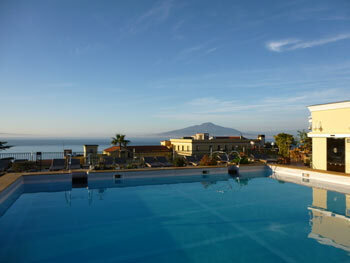 A flat can be a good way to experience Sorrento in a more independent fashion and live to your own timetable. 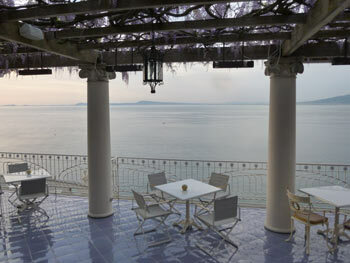 A tourist tax is payable in Sorrento between April and October. The cost of this should be stated on the hotel booking page, though it won't be included in the total price quoted. You pay the hotel directly. The amount varies according to the category of your accommodation; expect to pay between 1 and 2 euros per adult per night. Parking, if your hotel offers the facility (space is at a premium here), may incur a daily charge, so if you're driving, check the hotel page carefully. A final note: Sorrento faces north, so balconies and terraces with views are often overshadowed by the buildings behind and don't get the amount of sunshine you might expect. The historic centre of Sorrento, still partially bounded by old city walls, the sea-cliffs and ravines, is composed of picturesque narrow lanes and tall, old buildings. This is the place to stay if you want to enjoy the bustle of the central shopping lanes, the proximity of a large range of restaurants, being able to walk everywhere significant, and easy access to transport for excursions. The accommodation options here - suited to the types of building and space available - are mostly B&Bs, holiday apartments and small 'town' hotels, on one or more floors of a historic building. Some are elegant places to stay and others are simpler with cheaper prices. There are very big advantages to staying in this area - the atmosphere, the convenience, the history - but you won't be likely to find large open spaces, big views, swimming pools or terraces. Unless, that is, you splash out on a luxury hotel. Sorrento has a good selection of five-star hotels and smart four-stars, and there is a scattering of these along the top of the cliffs in the historic centre. Prices aren't always as high as you might expect, especially out of the peak summer season, so if you want to combine staying centrally with having an elegant retreat from the crowds, perhaps enjoying a cocktail on a rooftop while looking across the Bay of Naples, you'll find a few good options. My personal preference would be to stay centrally, in a smart hotel with outside space, if affordable. Best for: culture vultures, busy sightseers, honeymooners, keen shoppers, and the rich. I've stayed in the Grand Hotel La Favorita (comfortable five-star with a roof-terrace bar and pool - read my review) and in Sorrento Apartments (practical central holiday flats, fairly basic, cleaned daily); I'd recommend both. The best views which actually include Sorrento itself can be enjoyed from the hills behind and to the west of the historic centre. 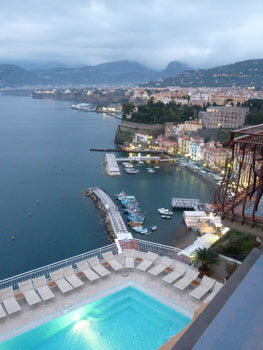 Several hotels along the coast road just outside the centre have balconies and pools with amazing views. Outside the historic centre your money goes further, and features such as balconies, terraces, views, and swimming pools are all more attainable. You're more likely to find parking at these out-of-centre hotels, too. However, if you want to visit the centre, take a stroll, choose a restaurant or catch a ferry you'll have a walk or bus ride into town (some hotels further out have a shuttle). The coast road is busy with one narrow pavement, so although the walk is scenic it may become a bother, especially after an evening out when you'll be trudging uphill. If you plan to spend lots of time at your hotel enjoying the facilities though, it's a good compromise. Best for: a lazy holiday, a break from the bustle, reading on your balcony, lounging by a pool, enjoying the view. Sant'Agnello is the next town along from Sorrento. You can actually walk between the two, although the roads can be busy and not terribly scenic. Buses run to Sorrento. Sant'Agnello is a popular place to stay, with a selection of hotels, including some large and smart sea-view establishments. There's more space to breathe than in central Sorrento, and you can find larger hotels with more facilities than in the centre, generally at cheaper prices. You'll probably find yourself heading into Sorrento if you fancy a bit of life, but there are a few places to eat and drink in Sant'Agnello itself, including the opportunity to enjoy a classy aperitivo with views along the coast. A pedestrian tunnel winds down to the bathing establishments built with wooden platforms at the foot of the cliffs. Best for: laid-back honeymooners, cliff-top views at a lower price. Beyond Sant'Agnello, in the direction of Naples, are Piano di Sorrento and Meta di Sorrento. Much like their sister towns, these are sprawling conurbations built over the plateau, separated by low cliffs from the sea. Meta actually has a triangular beach which gets very popular in summer, given the shortage of beaches in the area. These areas are relatively uninspiring, but may be cheaper and quieter than Sorrento. There are a high proportion of non-hotel options here, that is, B&Bs, holiday flats and rooms to let. If you're interested in the Sorrentine peninsula in general, but not particularly keen on Sorrento itself (perhaps because you want to avoid crowds), you'll find various accommodation options scattered along both the north and south coasts and the hills in between. Staying in the countryside or a village will give you a totally different type of holiday experience; you'll experience a much more 'authentic' rural Italian atmosphere, with opportunities to stay or walk among lemon and olive groves, relax on a pebble beach or watch the activity of a fishing harbour. Buses connect villages with Sorrento, and even the smaller seaside settlements are likely to offer the occasional boat excursion in summer. Best for: off-the-beaten-track explorers, seekers of peace and views without the crowds, travellers touring with a hire car, self-starters. > Marina del Cantone - low-key seaside settlement with a pebble beach on the southern coast. > Massa Lubrense - little town towards the end of the peninsula with a picturesque fishing harbour on the coast below. Frequent buses to Sorrento. 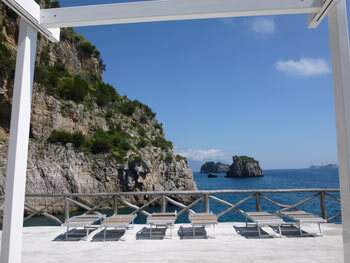 > Sant'Agata sui Due Golfi - sprawling village on the top of the peninsula, proud of its views over both coastlines. Well-connected by buses, with a choice of restaurants and hotels, though it's sometimes lost in the clouds.